When it comes to having an online businesses I tend to start to itch a bit when I hear the word “code”. It usually means that I’ll need to either spend hours figuring out how to make the code work or spend lots of $$$ to hire someone to do it for me. When I heard that you can now track Pinterest Pins on Google Analytics with UTM tracking codes the itching began. Yes, it would be great to track individual Pinterest pins to really monitor their effectiveness with a free service like Google Analytics but there was that dreaded word, “code”. Ugh. But what if you want to monitor how a particular pin is working for you including the repins of your original pin? This is where using UTM tracking codes can come in handy. Thankfully, they’re easy to do and you won’t have to hire professional help to use them. I asked Ralph Rivera, who’s personal tagline is “I love marketing and code” to help me understand how to use UTM tracking codes with Pinterest. Ralph is the owner of 2 web development and marketing businesses as well as a web development adjunct professor at Manhattan College. In other words, he knows his stuff! Click here to access Google’s URL Builder, the key to creating UTM tracking codes easily. When Ralph and I did some testing, we found one major drawback to using UTM codes on Pinterest pins. It stripped away the rich pin information from our test pins. However, fellow Pinterest pro Vincent Ng found that his rich pin information returned after a while during his testing. Pinterest is known for rolling out certain features to some accounts and not others. This might be what has happened in this case, I’ll be sure to keep you updated. If you want to use UTM tracking codes on your Pins I suggest you do some testing first. For more information about UTM tracking codes, be sure to also check out Vincent’s article and video: UTM Tracking Codes and Pinterest – How They Work. Also, check out Stephanie Garcia’s article How to Use UTM Tracking Codes with Pinterest Pins on her site Hey Stephanie. If you really want to get into UTM tracking codes be sure to get Stephanie’s free Pinterest Google URL Builder Worksheet. To find data about the posts or pages getting traffic from Pinterest in Google Analytics, click acquisition then social. Find Pinterest on your list and click. You’ll then see a list of the posts or pages receiving traffic from Pinterest in descending order. To track individual pins, click acquisition then all referrals. Select Pinterest form the list that appears and you will be show a list of of Pinterest pin urls that brought you traffic from that time period in descending order. Do you use Google analytics to monitor your traffic from Pinterest? Will you be using UTM tracking codes? Let me know in the comments below, I’d love to hear about your experiences. Hi there! 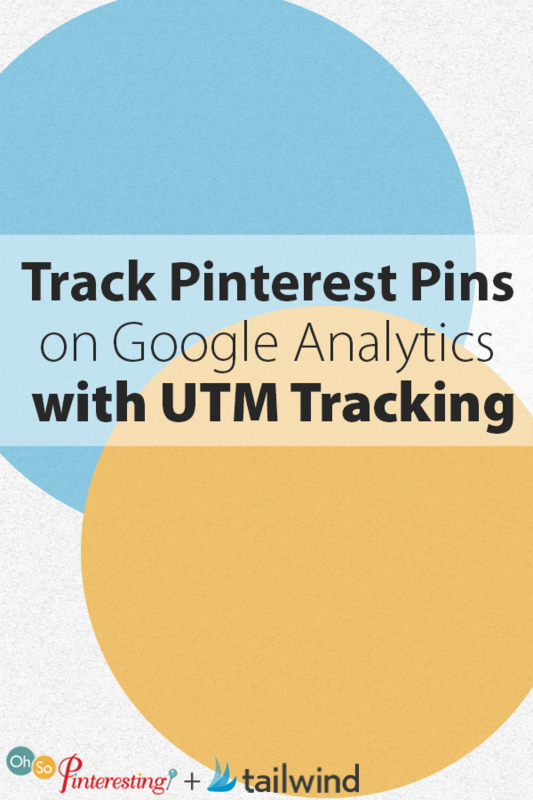 I watched your video on Track Pinterest Pins on Google Analytics with UTM Tracking Codes. It was very helpful! But now I don’t know how to find the information in Google Analytics. Could you point me in the right direction? Thanks! Hi Sarah, could you reach out to me david at tailwindapp dot com with some more details and I’ll see if I can’t help? Thanks!